Central to the vision of the future Williams Lake Resort is a pedestrian design with increased public access to the property. The Williams Lake Project resort and amenities will be open to the public; trails and lakes will be open to the public under a day-use fee system. The most significant public access enhancement is the opening of over 1½ miles of rail trail formerly closed to the public. Finalized in September of 2013, this land donation and conservation easement, in partnership with the Wallkill Valley Land Trust and the Open Space Institute, greatly expands public access to the property and allows for the reconnection of the historic trail to the City of Kingston to the north and New Paltz and Gardiner to the south. 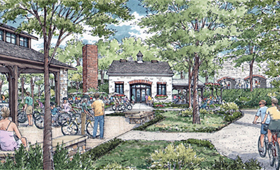 The rail trail will pass by the future resort hotel and will run adjacent to a historic interpretive center, an outdoor activity center, an open-air ‘kiln café’ and the extensive trail system. The Williams Lake Project is committed to sourcing labor and materials locally. Examples include partnering with local farmers and farmer’s markets to source organic food; working with local labor including unions during and after construction; and sourcing materials from local and regional suppliers. The new Williams Lake Resort will help existing businesses grow in the Town of Rosendale. Demand for goods and services will increase as resort guests and home owners shop locally at area restaurants, shops, art galleries, and visit venues such as the Rosendale Theatre. Direct pedestrian and bike access from the Williams Lake Project to Main Street Rosendale via the rail trail will help drive visitors to Main Street and further spur spending in town. As planned, the proposed resort will create significant positive economic benefits for the region. Fiscally, the Williams Lake Project will generate more than 4 million dollars in new net tax benefits to Ulster County, the Rondout Valley School District and the Town of Rosendale. Economically, the new resort and housing will generate 300 new permanent full time jobs and over 1,300 construction “job-years” (an average of 134 construction jobs over the 10-year project build-out). These new jobs and tax revenue will provide a much needed boost to local and regional businesses. These positives are enhanced by the project’s commitment to source materials, services and labor locally. Significant positive increase in jobs, fiscal benefits and ancillary spending in the community.